According to South Korea’s Yonhap news agency and The Wall Street Journal Samsung will adjust the production schedule of the Galaxy Note 7 amid safety concerns. According to a source close to CNN the production has been temporarily suspended. The decision to make production adjustments come amidst weeks of mounting reports the South Korean Tech giants most recent phone has explosive tendencies. The source of the danger is the unstable and poorly manufactured lithium-ion battery used to power the Galaxy Note 7. “Battery-gate” has not been easy on samsung. They now stand, singed in an overcrowded smartphone market. One that was most recently invaded by Google who in early October relieved the Pixel and Pixel XL . Some have speculated the iPhone 7 could have the same explosive tendencies as the Galaxy Note 7 but as of now this seems to be a unique situation and is not any cause for alarm. As of now Samsung is the only major producer of smartphones to be under such public pressure. Last month Samsung issued a recall of nearly 2.5 million Galaxy Note 7’s. They hoped they curb the problem by switching the devices with replacement Galaxy Note 7’s. However there are reports coming in that even the replacement phones have been catching fire after overheating. In the last week alone an American using the device reported the phone caught fire without even being plugged into a power source. 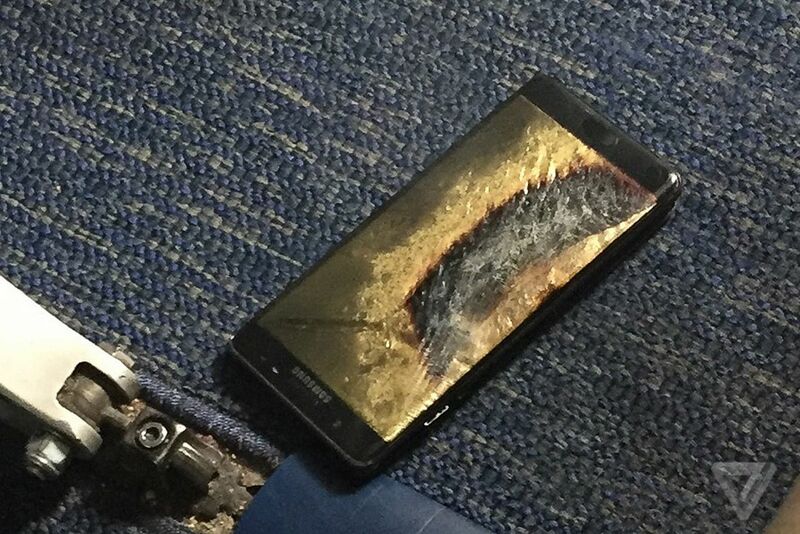 Days later a Southwest Airlines flight was cancelled when a passengers replacement Galaxy Note 7 began billowing smoke before take off. The U.S. Consumer Product Safety Commission, who helped urge Samsung to issue the initial recall, said they would be keeping a close eye on the investigation into the case of the Southwest Airlines flight. The move to temper and halt production of the Samsung smartphone will certainly have steep financial repercussions. According to CNN and TuanAnh Nguyen, a research analyst at Canalys, the decision could cost the company billions of dollars in the next six to nine months. Nguyen did have some advice for the smartphone manufacturer, “Samsung needs to quickly put an end to the Note 7 line so as not to get deeper into trouble with recalls and faulty devices which will tarnish its brand.” But even if Samsung had a plan to end the recalls phone carriers are taking action into their own hands. An AT&T representative told CNNMoney on Sunday that, “based on recent reports, we’re no longer exchanging new Note 7s at this time, pending further investigation of these reported incidents.” This announcement is more bad news for Samsung who is already doing everything it can to stop the hemorrhaging.